I’ve well and truly caught the baking bug. Every year the Great British Bake Off has the same effect on me of wanting to become a domestic goddess and whip up batches of fairy cakes in all flavours and colours. Recently my mum attempted rhubarb jam that didn’t quite set, so I thought I’d use it to invent some rhubarb filled cupcakes. The rhubarb jam is very tart meaning I didn’t want to overload on too much of a sweet taste so opted for a cream cheese frosting. 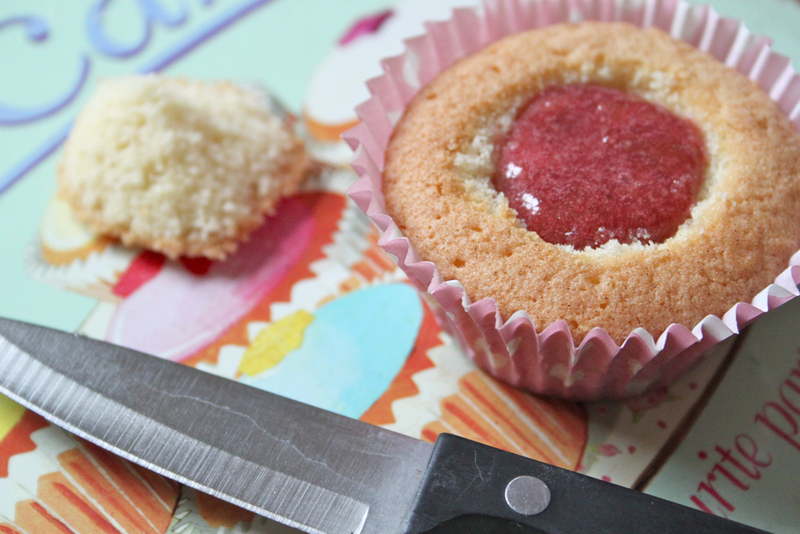 Once you have made a fresh batch of cupcakes allow them to cool then create deep holes using a sharp knife, but be careful not to cut all the way to the bottom. Next spoon in a small amount of rhubarb jam (recipe here) and pop the lid back on so the jam doesn’t merge with the icing. 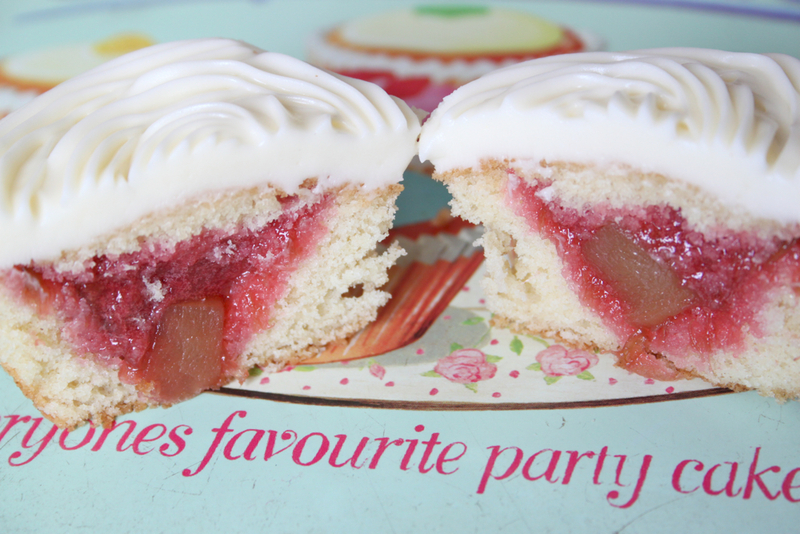 I cheated and added pink food colouring to my rhubarb jam to make the cakes look extra pretty! Once you’ve filled all of the cupcakes whip up some cream cheese frosting (recipe here), it’s super simple to make and actually takes less time than ordinary buttercream icing. I learnt that you should allow it to set slightly in the fridge for around ten minutes or else it will be difficult to pipe into a neat shape, as you can see from my rather dodgy attempts below. 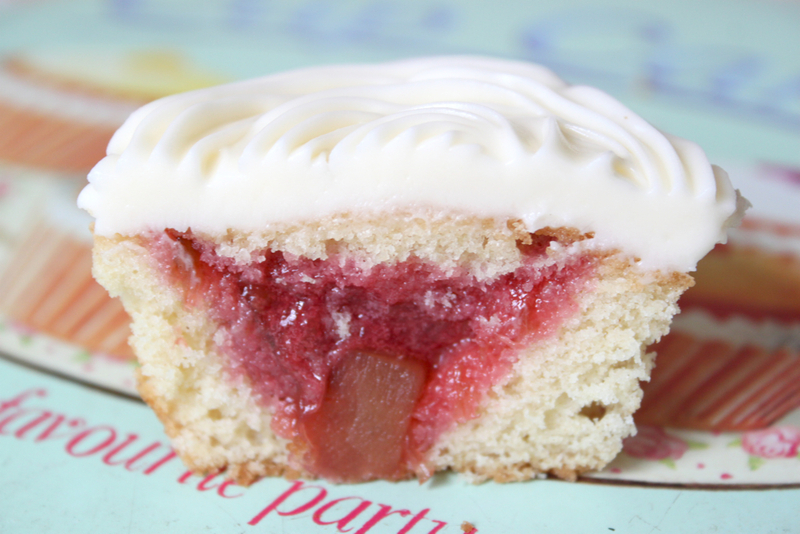 You can try this with lots of different jam and icing flavours, next I’m going to have a go with strawberry jam and regular buttercream icing which is a little less exciting but more traditional.